SYNOPSIS: Monsieurs Richard and Moncharmin have recently bought the Paris Opera House, where the retiring manager warns them that they may hear stores about an Opera Ghost who always sits in Box 5. The new owners laugh at such childishness, but soon strange incidents begin to occur. Joseph Buquet, a stagehand, has seen the Phantom, and describes him as a faceless man with no nose. A man suspected of being the Phantom is a mysterious Persian, who is frequently seen wandering through the opera house. Carlotta, the prima donna of the opera, is furious because she receives many notes threatening her if she does not yield her role to the young ingenue, Christine Daae. One evening, Carlotta is mysteriously taken ill and her role is played by Christine. In the audience that evening is her handsome suitor, Raoul de Chagny, and his brother Phillippe. Christine is a tremendous success, singing the role of Marguerite in the company's production of Faust. After the show, Christine hears a strange voice, like that of an angel, coming from her dressing room wall, telling her that he has made her a star at last. 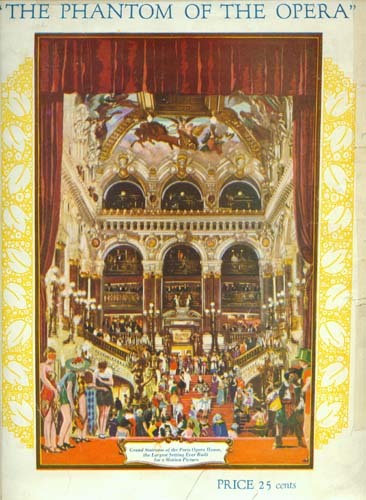 Carlotta continues to ignore the threatening letters and, although the owners are warned that a disaster will occur if she goes on, Carlotta performs in Faust that evening. The lights begin to flicker, and the great chandelier falls on the crowd. During the panic, Christine goes to her room, and the voice from the wall beckons her to walk through her mirror. The mirror swings open and Christine enters where she sees the Phantom, a figure cloaked in black and wearing a featureless mask. He leads her by horse through the catacombs, and eventually by boat across an underground lake to his lair. Realizing that he is the Phantom, she faints, later awakening in a room that has been prepared as if for a queen. Hearing music, she returns to the main room, where the Phantom is playing the organ. While playing, she sneaks up behind him and rips off his mask. He turns, revealing his horribly disfigured face and she cringes in horror. Telling Christine that he loves her, the Phantom agrees to let her return to the surface one last time before she comes away with him. At the Bal Masque, Christine and Raoul secretly meet while the citizens of Paris engage in their annual revelry. A mysterious figure cloaked in red and with a skull head, marches into the proceedings and denounces the partygoers. On the rooftop of the opera house, Raoul and Christine reaffirm their love, and Christine tells Raoul everything about the Phantom. 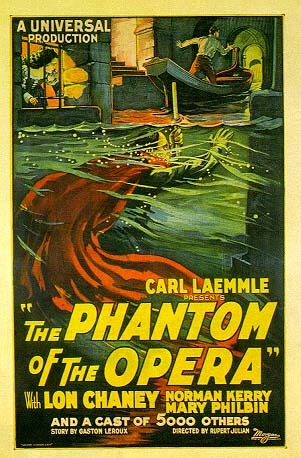 As they plot their escape, the Phantom hears them and realizes that Christine has betrayed him. Meanwhile, the mysterious Persian has revealed himself to be Ledoux of the Secret Police, and he is now convinced that the Phantom is Erik, a madman he has been tracking for years. That night, Raoul plans to take Christine out of the country after her performance, but Erik has learned of their plans, and when the curtain rises, he blacks out the lights and abducts Christine. Ledoux tells Raoul that he can lead him to Christine, and the two enter the mirror in Christine's dressing room. The two wind their way through the catacombs, where Erik again has taken Christine. Simon Buquet discovers that his brother Joseph has been murdered, and having discovered Erik's hiding place, he plans to lead a mob to destroy the Phantom. Phillippe de Chagny has also discovered the entrance to the catacombs, and goes in search of Raoul. He sets off an alarm, Erik slips through the black lake and overturns the man's boat. Raoul and Ledoux fall into a trap, and when Erik discovers his victims, throws a switch that fills the room with searing heat. As the men suffocate from the heat, they discover a trap door, but their escape route is, in reality, just another trap...a room filled with explosives. Erik takes Christine to a cabinet where she has two levers to choose from, one that will free her lover, and another that will blow the entire Opera House to bits. She chooses to go away with Erik in order to save Raoul, and water begins to rush into the room full of explosives. As the men are drowning, Christine begs Erik to save them. He fishes the men out of the water, and as the mob draws near, Erik abducts Christine, throws her into a coach and drives madly through the streets of Paris. The coach overturns, and Christine escapes, leaving Erik to run madly for his life. He is finally cornered by the crowd at the banks of the Seine. Pretending to hold a grenade, he holds the crowd at bay, then in a final hideous moment of triumphant laughter, reveals that his hand is empty and the crowd beats him to death. Christine and Raoul are happily reunited. 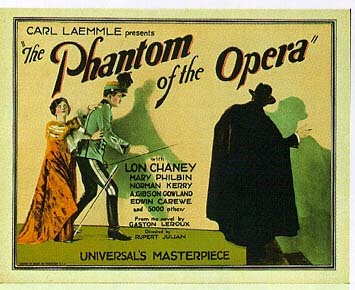 NOTES: THE PHANTOM OF THE OPERA is undeniably Chaney's most famous role. It has inspired five remakes (in 1943, 1962, 1983, 1989, and 1990), numerous rip- offs, and the blockbuster Andrew Lloyd Weber musical. The film is listed by most historians as one of the 10 greatest films of all time. 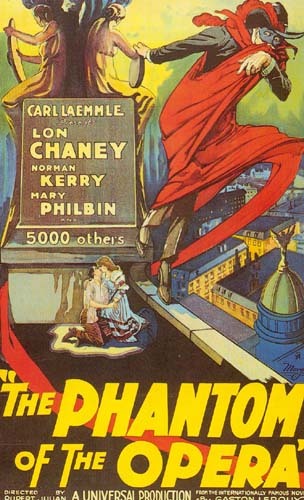 An apocryphal story circulated over the years states that Irving Thalberg loaned Chaney to Universal to make PHANTOM because he realized that the film would be a huge success and would elevate Chaney's box-office draw. The story makes great copy for movie star magazines, but was untrue. 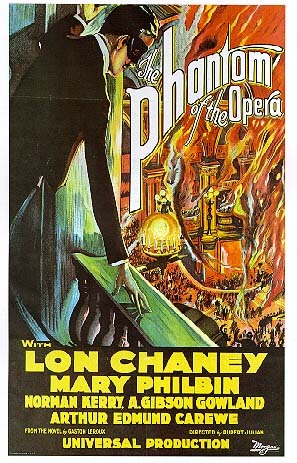 Chaney was still a free agent at the time he made PHANTOM and did not have to negotiate a release from MGM. Chaney had no particular love for Universal and Carl Laemmle, but he recognized a good opportunity when he saw it, and recalled his tremendous success in Universal's THE HUNCHBACK OF NOTRE DAME two years earlier. 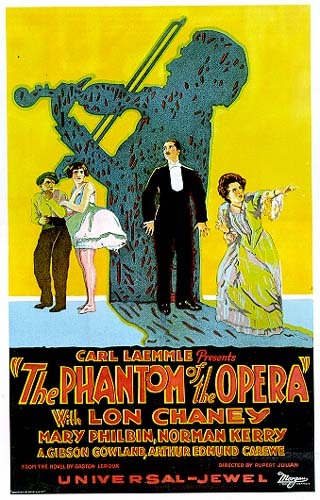 Despite the accolades of modern critics,THE PHANTOM OF THE OPERA was a movie that almost never got made, as it was plagued from the start by production problems. Rupert Julian, an actor and director who had worked at Universal since the teens, was selected to direct. Julian had previously worked as an actor with Chaney in THE SMALL TOWN GIRL and THE KAISER, THE BEAST OF BERLIN, a performance that made him famous as the most villainous of villains. Julian was so effective as "The Beast of Berlin," because he was, in reality, an autocratic director who reveled in bullying everyone on the set, including Chaney. The script went through numerous rewrites before and during production. Unconfirmed rumors have it that Chaney directed some scenes while Julian was storming around the set. After shooting was completed, the picture was previewed in Los Angeles in January, 1925. Carl Laemmle was unhappy with the preview, and ordered that additional footage be shot. 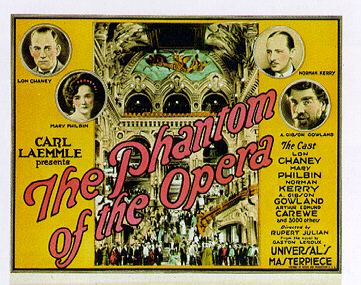 The original ending had the Phantom found by the mob, lying dead at the keyboard of his organ. Edward Sedgwick, better known as a fast-paced comedy director, was assigned to direct a new climax in which the Phantom escapes the mob by commandeering a carriage with a subsequent chase on foot through the Paris streets to the bank of the Seine. Astute observers will notice that the Phantom is chased past the Notre Dame cathedral set, still standing from THE HUNCHBACK OF NOTRE DAME. Additional romantic subplot footage was also shot with Ward Crane playing a rival of Norman Kerry for Mary Philbin's affections. Walter Anthony was hired to write new intertitles. In April, 1925, the film in its new form was again previewed, this time in San Francisco, and Laemmle was still unhappy with the reception the film received. Most of the new scenes, except for the exciting climax, were junked. New scenes with comedian Chester Conklin were added as well as more new intertitles. After viewing this version, Laemmle ordered the comedy scenes scrapped and still more intertitles were rewritten to account for the many changes. The film finally premiered on September 6, 1925 and achieved a tremendous popular success. The film cost $632,357 by the time the final print was previewed, including about $50,000 in retakes. The expense was worth it, as PHANTOM would go on to earn $2,014,091 in revenues, one of the largest figures for any silent film. The film earned Universal a profit of $539,682. 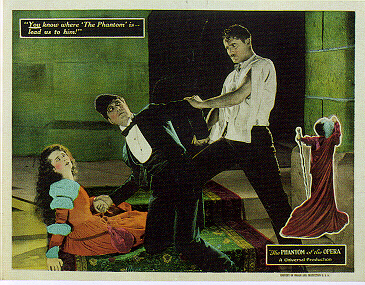 Several sequences of PHANTOM were originally shot in the early two-color Technicolor process, but only the famous Bal Masque color sequence survives. One striking scene with Chaney on the rooftop in black and white, with his cloak hand-painted in bright crimson survived only in black-and-white, but in 1996 was reconstructed with the cloak computer-colored red. 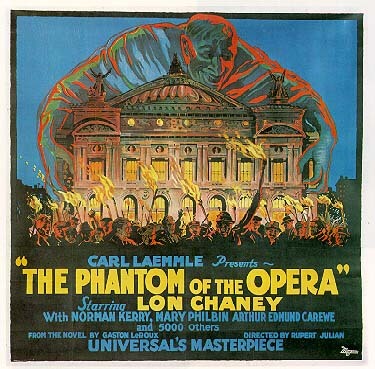 The impressive sets of the Paris Opera House and the catacombs, the color footage, and the lavish costuming all add to the atmosphere of the film, yet they pale next to Chaney's performance. This was truly the masterpiece of Chaney's career and ranks as one of the greatest tour-de-force performances of the silent era. Chaney spends most of the first half of the picture wearing a mask, and for a silent picture, this meant that all his emotion had to be conveyed with body language. Simple gestures with his hands and fingers take on ominous meaning as the Phantom leads Christine through the catacombs to his hidden chamber. The unmasking scene may seem tame by today's blood-and-guts, slasher-movie standards, but it delivered quite a jolt in 1925. Several press reports told of patrons fainting in the theatres during the famous scene. Chaney's make-up so distorts his features that he is almost unrecognizable. 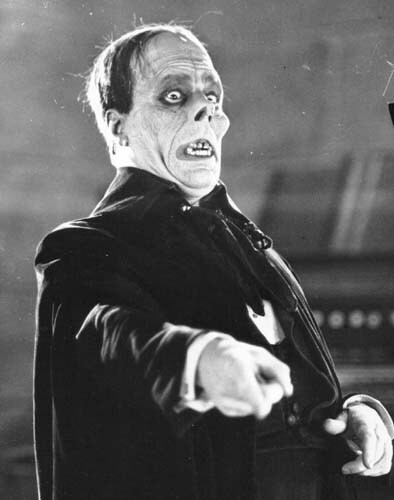 Chaney took the secret of his make-ups to his grave with him, but numerous writers have guessed at how he effected the hideous Phantom death mask. The most often reported method--placing disks in his mouth to raise the cheekbones--seems excessively painful and unnecessary, and he most likely built up his cheekbones with putty. Studying PHANTOM OF THE OPERA today is confusing due to the availability of several different versions. The film was reissued in early 1930 with an added soundtrack that included redubbed dialogue sequences and an eerie prologue spoken by a man holding a lantern in the catacombs. All of the opera footage was restaged for this re-release, although no new Chaney footage was added. The additional cost was $113,449...as much as many of the new Universal productions of that year. 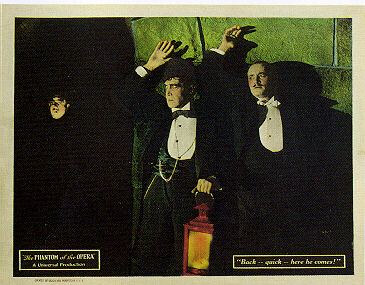 The reissue version, containing the now mute man-with-a-lantern opening, is the most frequently shown print of the classic. Author and PHANTOM expert Scott MacQueen believes the currently circulating "reissue" print to be a foreign release silent print from 1930, but this has not been confirmed. The original and the reissue prints may have been recut and combined over the years, making it nearly impossible to judge exactly what was released in 1925. The issue is further confused by the fact that some prints of the 1925 version have the ending from Rupert Julian's MERRY GO-ROUND, which also starred Kerry and Philbin, spliced onto the end! By the time this version was released, Chaney was at the peak of his popularity. Although he had no involvement with the reissue print, the film was a tremendous success, earning $419,096 in revenues, which translated to a profit of $123,428 for Universal. Universal inexplicably let the copyright of THE PHANTOM OF THE OPERA lapse in 1953, putting this timeless classic into the public domain, and costing the studio a fortune in lost royalties. For further information on PHANTOM, I highly recommend the excellent 2-part article by Scott MacQueen in the September-October, 1989 issues of American Cinematographer.